that is meant to be worn -- and not just jewelry. This particular crafts-person, from Northampton, works as a fiber artist who creates nuno felt by combining fine silk and the finest merino wool. While many think that the Paradise City Arts Festival hail from throughout the United States – and that is true – dozens call the Pioneer Valley their home. 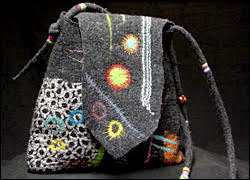 Traditionally, felt is created by using water, soap, wool and agitation. Felting takes time, physical labor and patience. She usually starts by hand-dyeing the wool (with natural dyes she has created herself from plant matter), which is then felted together with fine silk. To create patterns on the silk, Camacho-Sanchez uses techniques such as free motion embroidery, hand-stitching, beading and printing. 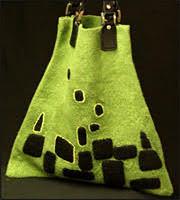 Her work is the result of a fusion of the ancient art form of felt making with modern techniques to create new and elegant styles.